From the Grauniad… Eavesdropping on Cave and Winstone arguing about fish and chips while pretending to drive from Brighton to Rottingdean feels a deeply odd way to spend a wet Wednesday afternoon, but then an atmosphere of strangeness seems to have attached itself to 20,000 Days on Earth, artists Iain Forsyth and Jane Pollard‘s feature documentary about Cave. For one thing, it has thus far been shot in secrecy. It was already long underway when Cave released his 15th album with the Bad Seeds, Push the Sky Away. The pair, who first worked with Cave on the video for his 2008 single Dig! Lazarus Dig!, began shooting at the singer’s invitation during the writing sessions for the album. “They filmed everything,” he says. “They had a camera set up in my office when I’m just writing the first lines of things, picking out the first melodies on the piano. That’s kind of why I let this go in the first place because you just don’t have cameras on bands doing the actual thing. via Nick Cave | KOKO Ballot. 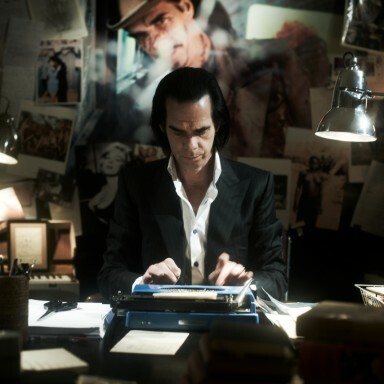 For our film, 20,000 Days on Earth we are looking for images of Nick Cave. If you have any pictures or video footage (short clips are best) that you would like to submit for possible use in the film, we’d love to see them. Please use the form below to submit your material, and try to indicate as best you can what year it’s from. These will form part of a short sequence that will survey Nick’s entire career, so your images can be as old or recent as you like. We’re keen to see Nick on stage, but also off – events, signings, meeting fans – and if we use your stuff you will of course get a credit in the film. via 20,000 Days On Earth | Upload.